I guess it's time that I got back to blogging. I have done almost no knitting in the past few weeks, and my computer was "having issues", which are now fixed, so let's see....what shall I post about this time? The Carmichael Aran sweater is finished. I'll take a picture when the light is better. I need to get it into the mail for the recipient. 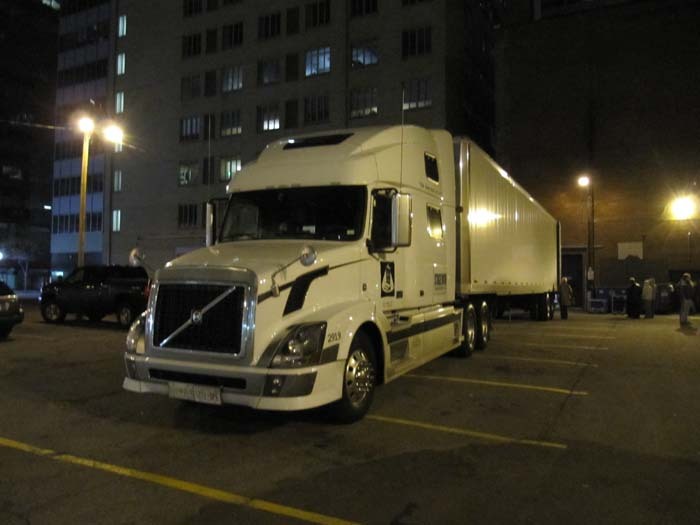 I've been to two concerts in two weeks, so I'll tell you about one of them, the most recent, first. Last Saturday night I went to the Paramount Theater in Denver to see Gordon Lightfoot. The last time I saw him was in 1968 at the Grand Theatre in Kingston, Ontario. Forty-two years have gone by, and I was very pleased to have the opportunity to see him again. The passage of time and a near-fatal long-term illness﻿ have taken its toll. He's very thin and appears frail and has aged a great deal, appearing older than his years. He'll be 72 years old on Wednesday (17th), but I'm very pleased that he's still able to go out on tour and share his amazing songs with us. 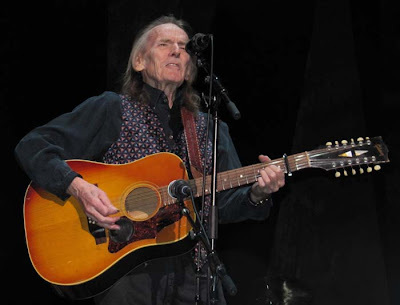 His voice was a little weak and he doesn't have the range that he used to have, but the voice is still unmistakenly Gordon Lightfoot. He had a bit of the imp in his eyes when he told a couple of "adult" jokes. He still has a lively spark about him! I took this picture as he was starting to sing The Wreck of The Edmund Fitzgerald in the second half of the show. Photos weren't really allowed, but I couldn't resist snapping a couple of quick pictures. I've waited decades to see him perform again. I didn't want to go home without a couple of photos to remember the evening. If I had one wish for the evening, I wish he would have played "Canadian Railroad Trilogy", but I'm not complaining. After more than two hours of playing and singing, including my favorite song, "Sundown", he came back for an encore and a final bow. And then it was over, much, much too quickly. I understand that the plate on the left is from a Canadian TV Show, Corner Gas. I've never seen it, but if it's still showing, I'll try to check it out when I'm in Kingston again. 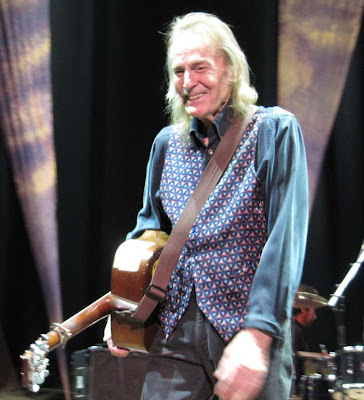 LOVE Gordon Lightfoot -- my husband played "Beautiful" for me the night we got engaged. Last time I saw him was at Massey Hall in Toronto -- sigh, makes me a little homesick just to see those pics. I have to say I was shocked and saddened when I saw these photos. 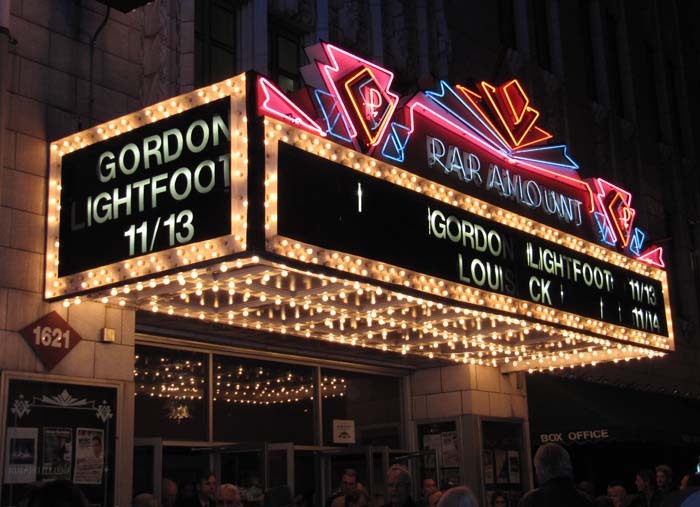 We have seen Gordon Lightfoot here in Denver and also in Seattle. I would not have recognized him. I'm glad he's still with us, sharing his beautiful music. Thanks for sharing this. He has really aged since we saw at WolfTrap in Virginia more than 10 years ago. His range had started to slip back then. Looks like he is still doing what he loves which is great!